DIY are the trend these days and no wonder it is getting popular day by day. Natural is the way for cosmetics and we have almost all cosmetic homemade products these days. It’s popular because you are in control of the ingredients totally and the most wanted DIY homemade cosmetic is the foundation. It is in foundation that you don’t get the color that matches your complexion completely. So here we are to sort out your issues with that and give you some simple homemade foundation recipes. Method: Take a small container and put the baby powder into it. Then add bronzer or pressed powder. You can take the press powder out with the help of a tooth pick. Mix them together without forming any lumps. After that squeeze out around one and half tablespoons of moisturizer into the bowl and mix well. Blend it well so that there is no trace of powder left. Now refrigerate this mixture for a couple of hours and then it will be ready to use. Method: Take a double filter and take almond oil, cocoa butter, Shea butter, vitamin E and beeswax into a glass container and place it in the double boiler. Melt these ingredients completely. This is the first step. Next remove it from the heat and let it cool down. Then add zinc oxide 0.5 oz. Mix well and then add 1/8 part of cinnamon to it. Add cocoa powder in small quantities until you get the required color. Mix well and your DIY homemade foundation is ready. You can adjust the quantity of cocoa powder as per your complexion. Once everything is mixed, transfer the foundation to a clean container and store it well. For the base of this foundation, you must take corn-starch, now it is to the corn-starch that you will be adding the color and attain the preferred color. When you make your own foundation, the aim is to attain the natural color that you will require and for this you need to have a fair idea about the ingredients that imparts color to this foundation. So here is list with the details. Method: Take a small bowl and measure the corn-starch into it. Now add cocoa powder, nutmeg powder and whisk it well. Put in the remaining contents in small quantity and build up the color that you want to attain. Keep testing the color by dipping the brush in the foundation powder and test it on your face. Once you have achieved your perfect color combination, and then add 10 drops of lavender essential oil into it. Mix it all well and your powder foundation is ready. Store it well in a clean container. 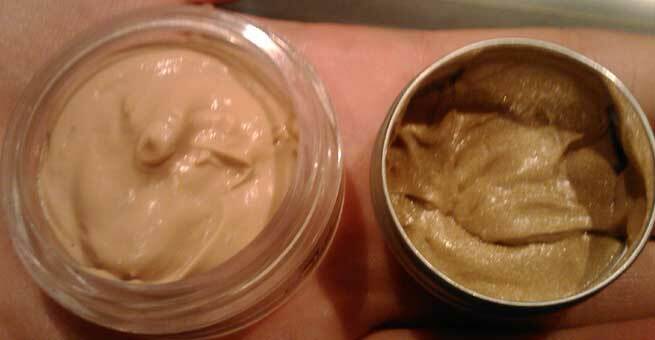 If you want a super easy liquid foundation and you have a powder foundation ready then you can make one very easily. All you need to do is take some powder foundation in a container and then to that add some organic oil; either olive or sesame would be great. Mix it and your easy liquid foundation is ready.